If that sounds familiar, don’t feel ashamed. You just haven’t experienced a grown-up macaroni recipe until now. Fellow food blogger, Mary, of The Arugula Files posted this tasty macaroni and cheese recipe. Since we’re not very good about following directions, we modified the recipe, though we did stay true to its vegetarian roots. Boil a large pot of water and cook 1 lb. small shell pasta according to box directions. Preheat oven to 400. Spray a 9×13” baking dish with cooking spray. Dice ½ yellow onion or chop ~4 spring onions and set aside. In a food processor, dice 3 small garlic cloves (more or less to your taste), 2 Tbsp. sun-dried tomatoes, add about 1 cup panko flakes to a food processor, pulse until all ingredients are combined. You should have a breadcrumb mixture seasoned with the key ingredients. Set aside until pasta is done. 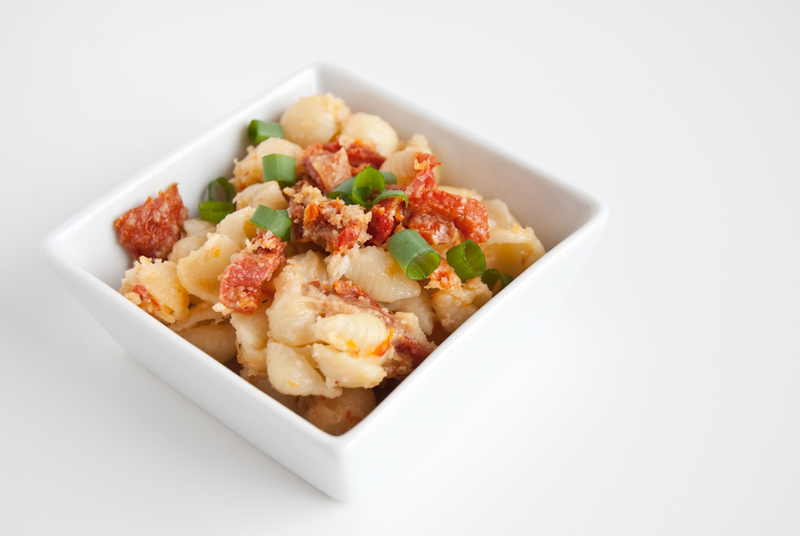 Drain remaining sun-dried tomatoes – we recommend using the whole 8-oz. jar of julienned tomatoes. When pasta is done, strain and place in baking dish. Immediately add 2 cups shredded cheddar cheese, ½-1 cup Muenster or mozzarella or a combination of the two, ~3/4 cup whole milk, and stir. Add remaining tomatoes, onion and salt to taste. Cover pasta with panko mixture and sprinkle with cheese. Bake until top is golden brown (about 15-20 minutes). Mac and cheese of any variety is a comfort food for many, and winter is the season for these warm, hearty favorites. To round out the mac and cheese into a more well-balanced one meal dish, add some protein and veggie mix-ins – bacon, ham, ground beef, meatless crumbles, chili, peas, broccoli, spinach, tomatoes, etc. The toppings can also be creative, depending on the amount of added crunch you prefer. This recipe is just in time to start planning your Valentine’s dinner menu. What a romantic treat! How Stacey Got the Shot: On the dining room table with foam core backdrop. Natural light, ISO 100, focal length 38mm, f/5, 1/80 second shutter speed. Had me going back for seconds and thirds! 10 thumbs up! Looks great, sounds yummy, seems healthy, too.